My five-year old peeked in at me from the next room. "What's that book?" he asked. "It's a book about making things and writing stories about them," I told him. "Like, imagine you made a gorilla out of your clay. And then we decided he could fly." "Yeah. And he couldn't ever land! He just had to keep flying forever!" We went on to have a long conversation about our flying gorilla, including details I would never have imagined. Just by talking about the idea of a writing maker space, my son was more creatively engaged in designing a story than he had ever been in his life. As an English teacher, I've always been keen to encourage his storytelling, but my suggestions that we write a story together and he illustrate it, or that he tell me a story, have never gained much traction. 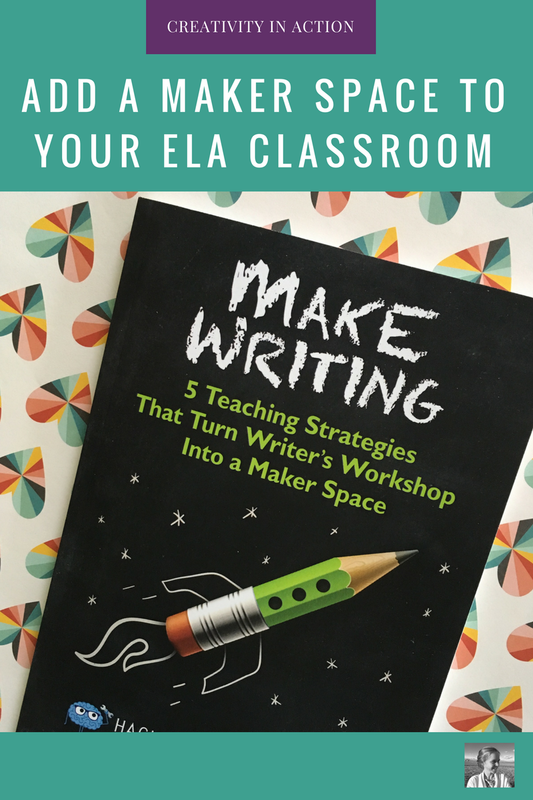 In the book, she goes through five main ways to incorporate making into the writing classroom. 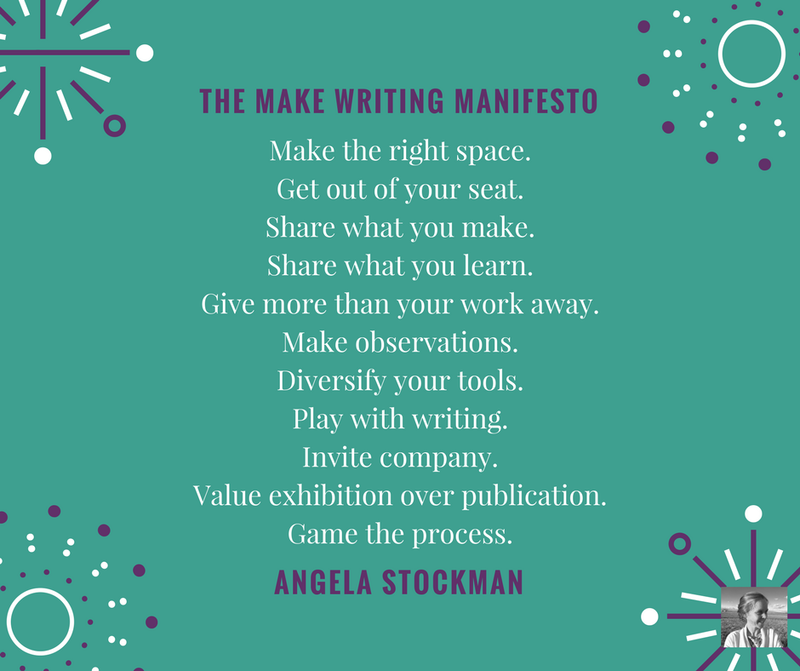 There are sections on making writing, creating a classroom space conducive to making, tinkering, authentic audience, and connecting this type of curriculum to standards ("not standardization," as Stockman often reiterates). It's common for someone sharing a new program to suggest how you can completely revolutionize your classroom with their new approach. Personally, I'm always looking for something new for my toolkit, but not to "revolutionize" my classroom. I just wrote a post last week about avoiding this kind of pedagogy overwhelm. 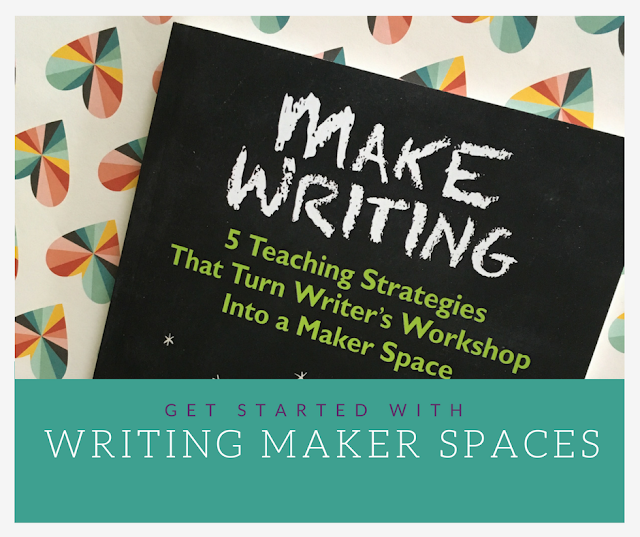 You may love eighty percent of what you already have going on in your classroom, but need a fresh creative writing unit, help for a group of struggling analytical writers, or a new way to build community among your students. Stockman can provide a wonderful new dimension to your class. There's no need to throw out the curriculum you already love to embrace the writer's makerspace. Here are five ways to incorporate making into your classroom, inspired by Stockman's approach. Stockman recommends keeping plenty of post-its, foam boards, and individual whiteboards on hand to help students who are drafting. "Sticky notes enable makers and writers to generate and organize abundant ideas, making them immediately accessible" (21). By letting them play around with their ideas physically, you help them get their thoughts in order. Students may have ideas for a range of plot twists in their story or a dozen different points for their restaurant reviews, but not have the foggiest idea of where to put those ideas and points until they start moving them around. Stockman even painted all her tabletops with chalk paint. 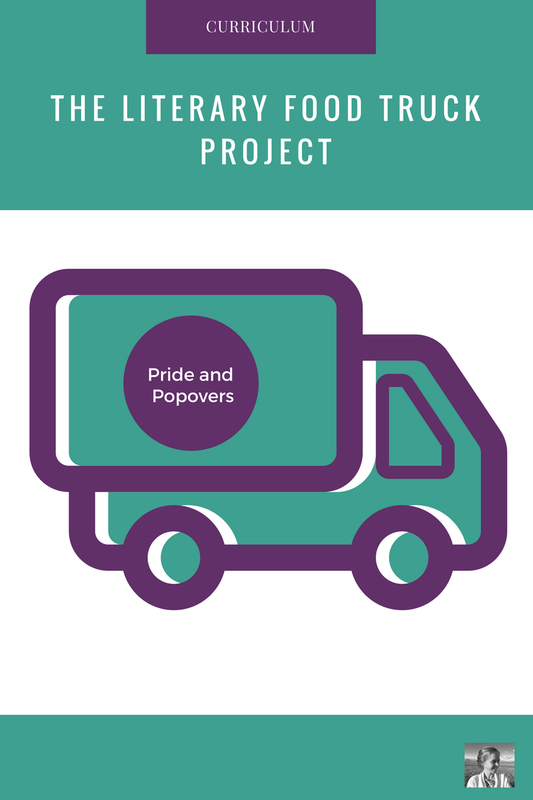 Dedicate a closet, bookshelf, or giant crate to your maker space kit, and keep it on hand for the right moments. This is my favorite idea from the book, and the most quickly and easily applicable. Let students create something - paint a character, design the building where a story takes place, do a photo collage inspiration board, etc. before they jump into the writing process. There's a great infographic in the first section of the book with a list of things students can make that help inspire different kinds of writing. "When we make play-doh creatures, our projects mights inspire us to write myths or legend that reveal their history." "When we make puppets, our projects might inspire us to write plays that feature all of the characters we create." "When we make music, our projects might inspire us to write song lyrics." Yesterday my son and I took out his magnet blocks and started building. We started with houses. As we finished, I began asking him questions. "Who lives in your house?" I asked. "Five people. And they just had a baby. Plus the mom and dad. So.... eight." He turned to a bowl of crackers he was eating and began breaking them into pieces, sprinkling them around the house. "The baby sleeps in this cracker. In the morning she wakes up and eats the cracker she slept in. So she can sleep in a cracker for..." (counting crackers in the house) "...six nights. Then she has to sleep in a real bed." I asked him if we could make a video about his house and tell the story of the people who lived there. He grabbed the camera and began a dialogue between the cracker people. Until I began to try it myself in my own house, I never would have believed that "making" the stuff of stories could be so powerful. I began to build a magnet block candy shop. One room seemed separate from the rest to me, and I quickly began to concoct a plot for the secret recipe room of a candy store. A segue between rooms suggested itself as the tooth brushing hallway, where everyone coming out of the hard candy room would brush their teeth all the way down the hall. Silly? Sure. A detail I never would have thought of without first making the set for a story? Absolutely. Students respond to real audiences. Writing for a few editing partners and the teacher just isn't enough. 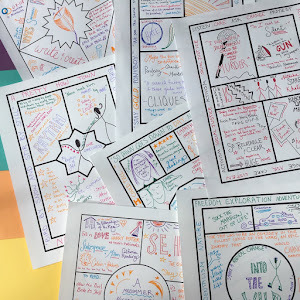 Connecting students with authentic readers helps inspire their best creative work. 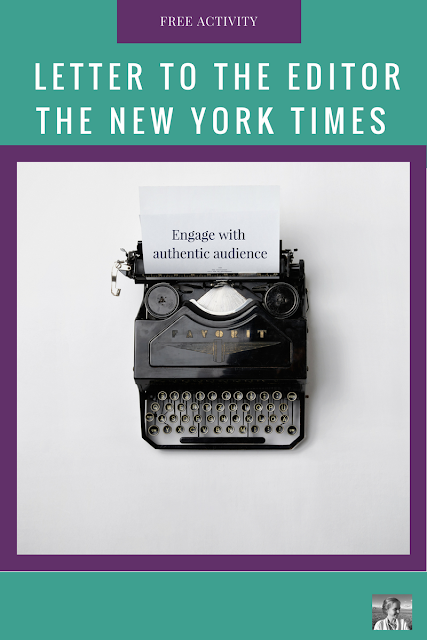 Stockman recommends checking out Write About, National Novel Writing Month, Wattpad, and Figment online, as well as looking into local newspapers and writing contests (like these eleven great writing contests to share with your students). 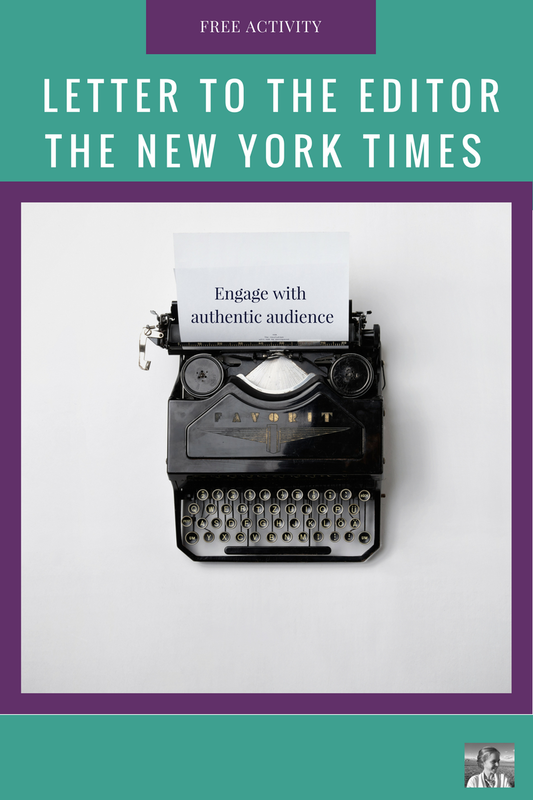 For an easy start, download this free activity for writing a letter to the editor of The New York Times. 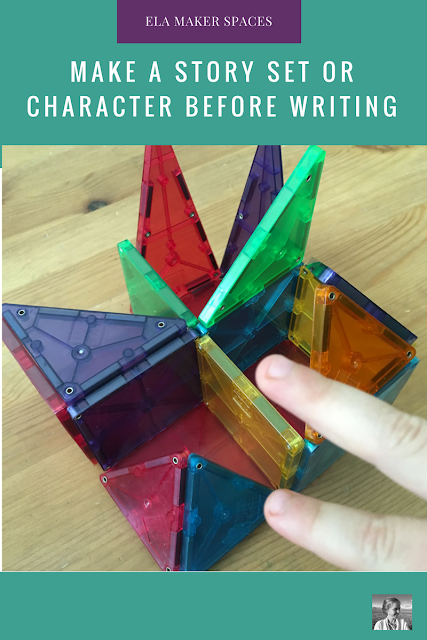 It can make a great enrichment project for your strongest writers, or an engaging whole class activity. This great idea caught me by surprise. Perhaps you too will wonder how you could have missed this in your teaching. Stockman recommends giving writers a chance to talk about what they are learning about the process of writing. "Make time for writers to share the strategies they are learning in addition to the pieces they produce" (76). If one student has figured out how to make good transitions between parts of her plot, another has found a way to mix and match descriptive writing elements from three mentor texts, and another just had an "aha" moment about how to write a killer conclusion, why not let them teach others? I've been thinking a lot lately about how to incorporate some flipped learning into a curriculum, and this strategy struck me as a great opportunity to let students create shareable videos. If you are spending your class time writing in your makerspace, consider letting students create the homework - videos to watch at home explaining the strategies they are using for success. Finally, don't get hung up on how maker spaces connect to standards. One of my favorite phrases in the book is Stockman's final mantra, "pursue standards, not standardization" (81). She pushes hard for deep reflection about what you hope to achieve as a teacher, what your own standards are, how you want to help your students, and how you can keep the standards that you set separate from conformity and standardization. 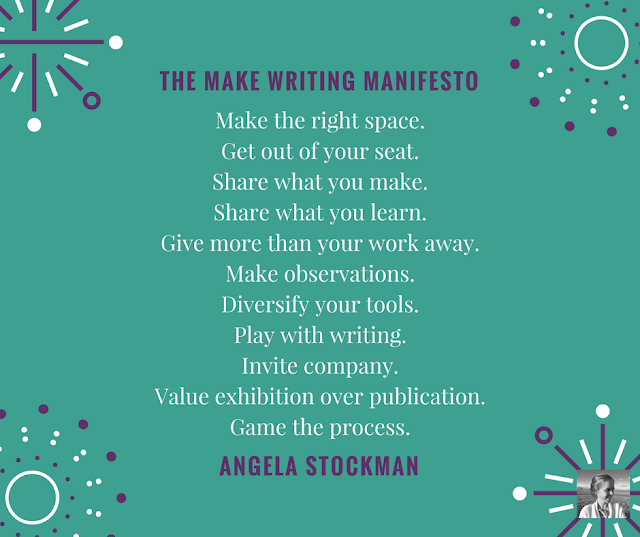 In a helpful section called "What YOU can do tomorrow" at the end of the final chapter of the book, Stockman shares this prompt, which feels useful in the face of standards-based pressures whether or not you want to jump entirely on board the writing makerspace train. "Define your purpose. Craft a credo, a manifesto, or a purpose statement that defines your stance. Why do you teach? What kind of learner are you hoping to shape? How do you hope to influence your community, your school system, and the colleagues you support? Why do you matter? In what ways will you help your students matter? Why are high standards important to you? Why should learners pursue them?" (83). Stockman, of course, is considering this topic because a classroom given entirely over to a writing maker space may not immediately appear to be accomplishing the daily tasks of the common core. Deep learning is clearly taking place in her maker space, but not in neat order. However, my guess is that most readers of the book, like me, will quickly identify some wonderful takeaways from the book but choose not to revolutionize their classroom entirely into a maker space. A maker corner? Absolutely! A maker unit? Yee-haw! A maker festival? Love that idea! Read the book for yourself if you want to dive deeper into Stockman's theory and techniques. Or begin by testing out these four applications and see if you want to dig deeper. Looking for an easy way to add a bit of making to your curriculum right now? Check out my literary food truck project. You'll be reveling in the combination of great food and stellar literary analysis in no time. If you're not already there, I'd LOVE for you to swing over and join our community of creative ELA teachers in our Facebook group, Creative High School English. We need your voice! I love this idea. I love your food truck and character ideas. Do you have recommendations for ideas for other maker spaces or websites? This seems like a new-ish idea for ELA (I have been interested in it for science, but I am a middle school ELA teacher). I am envisioning maybe genre studies using it somehow to model the types of reading we are doing? Or poetry stations?